Jenny K: I don’t know…the world must be coming to an end. I watched Delhi Belly the other day and didn’t hate it near as much as I thought I would. Yes, it’s disgusting and gross, just like I thought…practically a Hindi Dumb, Dumber and Dumbest. However, it was pretty tightly scripted for one of those things, and the cameo appearances were good. I especially liked Vijay Raaz (Monsoon Wedding) as Cowboy the thwarted drug baron. He was really evil in a very charming way. And, even covered with plaster dust, Imraan is always Imraan. Short synopsis. Three slacker friends live in one incredibly dirty apartment in Delhi. Taashi (Imraan Khan), the semi-normal one, has a very rich girly fiancee, Sonia (Shenaaz Treasury). Sonia smuggles something into the country, as a favor for a friend. She has no idea what she’s carrying. She passes the delivery on to Taashi, who is very busy trying to be a “real reporter” not just a gossip journo, and passes it to his photographer and roommate, Nitin (Kunal Roy Kapoor), who has eaten something dangerously bad (any roach-riddled thing in their kitchen!) and is nursing the worst case of Delhi Belly on record. His bowels play the actual soundtrack to the film. Almost not kidding. Due to his frequent emergency dashes to the loo, Nitin passes the delivery on to their other roommate, Arup (Vir Das) an unassuming cartoonist, silently seething in incipient anarchy against his boor of a boss. At the same time, he’s to deliver Nitin’s stool sample to the doctor’s office, and, of course, mixes up the two packages and delivers the crap to the drug baron. The whole rest of the movie is the plotting that goes on, trying to trade the drugs for hostages, money, etc. And it’s pretty fun, if gross, to watch. And yes, Aamir’s cameo at the end in “Return of the Disco Fighter” is fun, but not really necessary. Julie M: I’ll watch for it at my library but the out-and-out Indian comedies tend to make me squirm, and I’m not a fan of extended poo jokes. I can barely stand the comic-relief characters in more serious movies. Yes, I’m looking at you, fat guy from Bodyguard. But having said that, the trailer looks fun. Unless it’s one of those situations when the trailer shows all the good parts and the rest is just bad. Like almost every Judd Apatow movie. Jenny K: No, it’s definitely better than those…trust me. I’m not a full-out slapstick fan, either. Julie M: My recent film was Road, Movie (2009) with (sigh) Abhay Deol, who I had wanted to see more of every since Zindagi Na Milegi Dobara, my first experience with him. Road is a great “film festival” type film, full of finely drawn characters and beautiful cinematography, a main character who finds himself during a journey, and plenty of heart. Here’s the trailer. Vishnu (Abhay) is a young, middle-class city dweller who yearns for more out of life than slotting into his father’s barely-there hair-oil business. When his uncle needs to transport his old mobile-cinema truck to a museum on the other side of the country, Vishnu jumps at the chance for a solo road trip and maybe some adventure along the way. He picks up a young runaway (Mohammad Faizal) who is his complete personality opposite, and when the truck breaks down an elderly mechanic (Satish Kaushik) bails him out for the price of a ride through the Rajasthan landscape. They get lost and wander without food or water, get picked up by the cops for having no papers, meet a gypsy woman (Tannishtha Chatterjee) on the run from an evil water-lord (Yashpal Sharma), conjure up a carnival and, like Sheherezade, find that they constantly have to show films in order to live for another day. By the end Vishnu learns to appreciate friendship offered with no strings and realizes what being a man really means. In addition to lovely, quiet performances from the stellar ensemble cast and constant, very lush visuals (including Abhay Deol), Road, Movie has some great stuff to offer the Bollywood film fan. I counted clips from no less than five classic films I had seen including Deewar, Umrao Jaan and Pyaasa plus many others I have not yet seen. In fact, hair oil as a theme and metaphor pops up throughout the film, not in the least of which is through the wonderful song “Sar Jo Tera Chakraye” from Pyaasa, which gets a pop remix in addition to showing the original number. Here’s the music video. The film moves fairly slowly and the camera lingers on the landscape and Deol’s sweaty, dusty frame far too often—I mean, often enough for me but maybe too much for someone else—however, I would recommend it for a nice change of pace away from romantic comedies and gangster shoot-em-ups. And it’s only about an hour and a half investment of one’s time. Road, Movie is available free on Youtube, unfortunately without subtitles. Jenny K: I watched Road, Movie on Netflix and it was an unusual one. I loved the dreamy, almost surrealistic quality of the road trip, with the women with the water pots on their heads appearing every so often, from nowhere without notice. I liked Abhay Deol and all the leads, especially Satish Kaushik as Om, were very good at their roles. The visuals were mesmerizing, with the director, Dev Benegal and the cinematographer, Michel Amathieu painting color-drenched murals behind the silhouetted truck. Remind me never to go to that endless plate of sun-parched salt where the mela “appeared”…I shuddered just looking at it. Why would I want to go there? Why would they? That is, in a nutshell, what the problem with this film is for me…dreamy as it is to look at, it didn’t make much sense. And the nonsensical quality wasn’t whimsically charming, as perhaps what they were going for, it just interrupted my “suspension of disbelief,” so often it became mildly annoying. Julie M: I guess that’s another difference between us. I was perfectly willing to suspend my disbelief and just enjoy the scenery (including Abhay), and let the possibilities wash over me. I’m not even 100% sure the carnival was real—it might well have been a thirst-induced hallucination—and I felt that the dry, endless desert represented how Vishnu perceived his life, dull and devoid of joy, and these other characters were personifications of lessons he had to learn in order to bring himself back into balance…the filmmaking technique certainly could lead one to think in that direction. I have to interject at this point, briefly, that after Road, Movie I saw Brick Lane (2007), also with Satish Kaushik and Tannishtha Chatterjee, this time as a Bangladeshi immigrant couple living in London with their children. Here’s the trailer. Brick Lane was a dazzling showcase for Tannishtha’s talents, and both of them acted extremely well and almost entirely in English. Overall, though, I found it not nearly as fascinating as the book. A.O. Scott from the NYT agrees with me. And that’s all I’m going to say on that. It’s available online, for $2.99 on YouTube. Jenny K: Pat and Kathy and I tiptoed through my Netflix queue the other day and gave into Pat’s not-so-secret crush on Shahid…we put in Kismat Konnection (2008), and only lasted about fifteen minutes before she herself was screaming for a change. Part of it was, I will admit, the Netflix subtitle cut-off problem on my tv. However, the plot was so weak, that I’ve blocked the whole thing out of my mind. Julie M: I found it on YouTube, free, subtitled, in parts. Maybe this will solve your subtitle issue, but not the screamingly bad issue. So you’re saying that I should nix my own Shahid leanings and avoid it, eh? Pity. Jenny K: Well, you seem to be willing to overlook his weaker movies, if he’s cute enough…so, you might still like it. We ended up ditching Shahid in favor of Aisha (2010) also starring our boy, Abhay Deol. It’s an adaptation of Emma, the novel by Jane Austen…or rather, it’s a remake of Clueless (1995) which was a better adaptation of Emma. The star, Sonam Kapoor, was less absent than she was in Mausam (but still as giraffe-like) as our rich girl Emma, I mean Aisha, gleefully filling her idle hours as a matchmaker to her shy, lower caste friend Shefali. It wasn’t obvious to a non-desi like me what was so low-caste about her; Shefali seemed nicer and prettier than our Emma’s crabby best friend Pinky (Ira Dubey), and so we lost a critical bit of the plot motivator, IMO. And because her father was not a stay-at-home recluse, why didn’t Aisha want to get married herself? No clue. Abhay played their version of Mr. Knightley quite well, but wasn’t really old enough to convey the “surprise” element of their romance. He wasn’t any kind of guiding/restraining hand for Aisha as Knightley was in Emma. They still fought cute, but you were mighty good and ready for them to realize their mutual affection, well before the end. Most of the supporting cast members were interesting, if not earthshakingly so. I particularly liked Arunoday Singh as Druv (the putative Frank Churchill) who was not nearly as reprehensible in his behavior as FC in the novel. Arunoday was quite buff and dapper with his red shirt and the spiffy Panama hat he wears in the dance number below. He has a better looking Gregory Hines thing going on. Julie M: I have to come clean and admit here that I am SO not an Austen fan and have never read Emma. I did see Clueless, though, so am somewhat familiar with the story. I have tried to get through P&P at least four times and not made it past the first few chapters, and perish the thought of anything else like Sense and Sensibility (although the recent version that adds sea-monsters might be more to my liking). So anything Austen, or twists on Austen, whoosh right over my head at least in their comparison to the original. I loved B&P, loved KK, and maybe I loved them more because I had absolutely no expectations. Jenny K: Not like Austen? Are you sure you’re a girl?? Does B know??? That sea-monsters comment is a dead give-away, BTW. Next you’ll be asking for zombies in Devdas! Jenny K: It seems all that I’m drawn to recently are prem kahaniyan, or in the gori vernacular, love stories…granted, not traditional romances, but in theaters or out, that’s what I’ve been watching. Here is my take on three of the most recent winners in the “luv stakes” races. First was “in theater”…three weeks back, some of my Hindi Movie Pack and I went to see the latest Imraan Khan film, Ek Main Aur Ekk Tu (One Me and One You, 2012). It was an almost sweet, not-quite-meet-cute, shot at romantic comedy that has Imraan depicted as an NRI “good boy” whose life ambition is to get along calmly and with as few disruptions to his life (and his parents’ wishes) as he can deliver. He has gone into his parents’ chosen field for him, architecture (they own a construction company) and is now serving his lowly intro-level years at a prestigious firm in Las Vegas. There he meets Quirky Free Spirit, hairstylist Kareena Kapoor at a shared psychiatrist’s office, and she disrupts his life plans (and ruins his haircut!) forever. In the course of trying too hard to prove himself “not boring,” they tie one on and wake up married in a handy Las Vegas wedding chapel! The rest is how they wend their way out of this mess. This is the first anti-shaadi film I’ve ever seen. I find it interesting that in the trailer they begin with those really early era graphics, because all through the film I kept being reminded of early Cary Grant films, you know, the ones with Kate Hepburn leading Cary around by the nose into one crazy scrape after another, and doing some of those almost patented double-takes, that Imraan seems to be born to wear, too. No, seriously, it’s also a physical resemblance…the height, the dark hair with the widow’s peak, the dimple in the chin…go check the old still pictures from the 1920’s and ‘30s! Not that Kareena is quite a Kate Hepburn, but I found, as the film unrolled, that I was interested in how their lives would untangle and if, indeed, they would end up together. No, I won’t say. Just that I enjoyed the ending, and didn’t want to scream at the screenwriters. Nice change. Also liked this number, where the action has moved back to India and the whole family (hers) has gone out to an “old fashioned” New Years Eve celebration at “the club,”dragging him along. I’m still in mourning for his Cary Grant-ish haircut. Julie M: I love cute rom-coms too, and have been craving one. Last one I saw and really liked, unequivocably, was a while back, Pyaar To Hona Hi Tha. And one of my favorite rom-com genres is “got married too soon,” (made famous on TV by Dharma and Greg). I missed it in the theater, but EMAET is one I will watch for as a library DVD. Kareena did not annoy me in the trailer–let’s hope it’s as enjoyable as Jab We Met (my fave Kareena rom-com). And was Farah Khan the choreographer for “Aunty Ji”? because it’s just her style. Jenny K: Not Farah…she’s really only directing now, and choreographs for her own films, and Shah Rukh’s occasionally. This one was a guy named Bosco Martis and another one named Rajeev Soorti is listed, too. Bosco is definitely in this making-of video. Jenny K: So, next on my oddball romance mix, was Dil Bole Hadippa! (The Heart Says Hurray! 2009) which put the balls in oddball…cricket balls, that is. You wouldn’t think that a cricket romance would be too unusual in Hindi film, Lagaan, right? But this one adds a cross-dressing twist. Rani Mukherji plays a cricket-mad Punjabi girl from Amritsar named Veera, who has always had a dream to be able to play on a national team but her gender stops her, despite her proven “mad skills” on the cricket field. One day after being turned away from tryouts, yet again, she goes back to her home with the troupe of wandering players she lives with and has to do a “trouser role,” off the cuff, if you’ll pardon the pun, to stand in for an actor who is falling-down drunk. Translated lyrics are under the original Youtube post. That she pulls this off successfully leads her to hope that with a little more work she can fool the newly arrived, London-bred son of the team owner who is now coaching his dad’s team. Shahid Kapoor plays Rohan, the tough-to-please coach who fails to recognize his newest phenom, “Veer” as the girl he’s both fighting with and romancing at the local fair; he thinks she’s “Veer’s” twin sister. Ah, the things we swallow for a fun romance with lovely big dance numbers like this one. I think that this is the most attractive persona that I’ve seen Shahid wear yet. Maybe because he’s not trying so hard to please, as Rohan’s natural disposition tends toward cranky. He sure can dance, though, and even delivers a convincing performance throughout the culminating cricket match where he gets to exercise those impressive biceps, and even does a creditably cute DDLJ Raj impression for Veera. Julie M: Again, another difference between us. I don’t mind Shahid at all, and he’s proven he can do Punjabi-milieu, dance, comedy and romance, in Jab We Met (a seriously underrated film in this genre). Dil Bole Hadippa! is another on my list of “to watch” given my insane fangirl admiration for Rani; however, since it hasn’t hit my library yet it’s not gonna. Guess I’d better find a place I can pay $3 to stream it. And you know you got me with Shahid’s dancing, and all the bhangra beats. The final leg of my romance trifecta, is an old one, Aandhi (Storm) from 1975. My pal Jayesh loaned me two films, and this was the first one that I got to, and boy was it unexpected. One of lyricist Gulzar’s directorial efforts, this must be his best to date. I’d seen his atmospheric ghost story with Vinod Khanna and Dimple Kapadia, Lekin… but haven’t actually finished it. I always thought that it was a bit too lyrical for my non-poetic soul. This one, on the other hand, was delightfully mater-of-fact for a romance. And it is telling the tale of a mature couple, Suchitra Sen and Sanjeev Kumar, who find each other again after years apart, all wrapped up in a story of political aspiration and machination. Extra bonus! The story begins with Artidevi (Suchitra in her second to last film) as a political force who is facing a troubled reelection campaign. Her campaign managers don’t know how she, a Ghandian pacifist, is going to fight her rivals who control the newspapers and the funding of the business elites if she insists on fighting a clean, honest campaign. She goes to another town where a rally is to be held and moves her headquarters to a hotel there. She feels oddly at home there, and finds that the manager of the hotel is none other than her estranged husband. She left him years ago when her desire for political office couldn’t be sated with a simple home life as a wife and…egad…mother! Surprise number one. The story goes on unfolding slowly in both the present and the past, letting us know the history of our couple, how they met (the best meeting I’ve seen in any Hindi film, surprise number two), how they married against the wishes of her wealthy, powerful father, and how they came to a decision that they couldn’t stay together. Surprise number three, no one is truly happy, but politics is a stern bedfellow, and asks a lot of one. Julie M: Wow, a romance with grownups. Or, rather, grownup actors playing their age, in a world that somewhat resembles reality. God bless the 1970s. Jenny K: Supposedly loosely based on the life and troubled marriage of Indira Ghandi, this film was banned for a year or two, until her death allowed the clearance to come through. Available, free from Shemaroo, on Youtube, with subtitles you can turn on, I’d highly recommend it. Julie M: Band Baaja Baaraat is a typical romantic comedy–and is entirely predictable — although well done and with very likable leads. 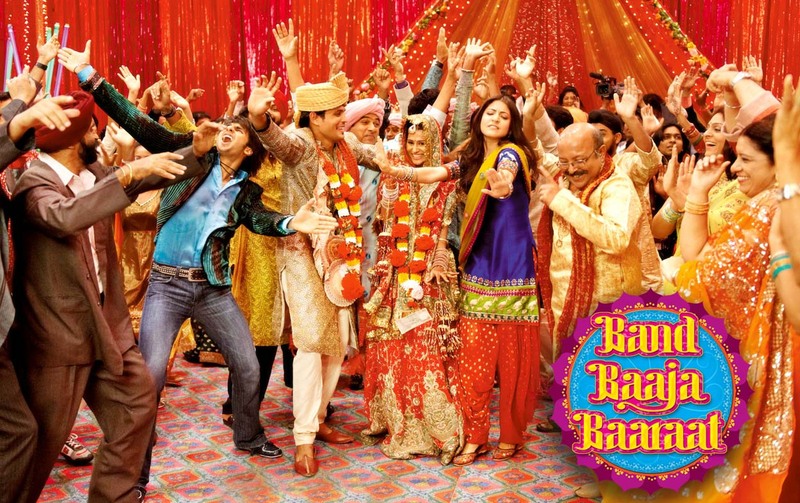 Anushka Sharma (last seen as Taani in Rab ne Bana di Jodi) plays Shruti, a “together” young Punjabi woman from Delhi with an ambitious life goal–she wants to be the most in-demand wedding planner in the world–and through a series of circumstances she ends up business partners with Bittoo (Ranveer Singh), an irresponsible cut-up trying to get out of working on his father’s rural sugar cane farm for the rest of his life. She has only one rule: don’t mix business with romance. Bittoo agrees, reluctantly because he is half in love with her already. They get along great, complement each other’s style, and become incredibly successful over the course of the next two years. One late night, partying after their first super-duper expensive wedding job, they end up in bed together, occasioning a fairly explicit (although not really showing anything) naked scene. The next day she realizes she is in love with him, while he makes it clear to her that he thinks of it as just a casual hook-up. The first half ends with the Big Reveal of this conflict. I’m not going to go into more plot details but you can probably figure out how it ends up. The business is affected, more circumstances throw them together again, and I don’t have to say more except there is a very romantic kiss that made me wish I was 22 again. Anushka is cute and fiery, and channels Kajol all the way in manner, facial expressions and dancing style. Ranveer is charming and very good-looking (VERY! ), and is more than competent in the role although to my mind he is much better at being the offhand wisecracking kook–he falls flat in the last 20 minutes as he takes on a more romantic persona. Their chemistry is excellent, and that, in addition to the high production value, is the key to the film’s success. The plot does not give over to slapstick and moves along with virtually no sub-plots. Costumes and sets are exceedingly colorful and exuberant–a plot point is that their business is known for “kitschy” weddings rather than the classy affairs a rival planner specializes in, no doubt occasioning much merriment in the office of the set dresser because they clearly had fun with it. Lots of highly visual, high-energy and danceable songs that are well-integrated into the plot and action. One song in particular “Ainvayi Ainvayi Lut Gaya” becomes their company’s “signature” number, which they perform at all the weddings they coordinate. Tons of English words, and both the songs and the dialogue is packed with pop-culture slang and references that give it a fresher feel than the tired plot would ordinarily signal. Here is “Ainvayi Ainvayi”, as performed at their first wedding job together, in which you see her starting out exasperated with him because he has booked this lame college band (his slacker friends) and then getting into the spirit of the song. No wonder their partnership and business take off. And it’s a total earworm as well—I’ve been humming it for three days. This song, “Dum Dum Mast Hai”, comes in the 2nd half at their biggest wedding job yet, where they have arranged for Shah Rukh Khan to perform but he has broken his ankle and they have to quickly, and of course absolutely unbelievably, pull together this massive dance number on 24 hours’ notice with themselves as the lead dancers. Jenny K: I never saw Band Baaja Baaraat, but the clips make it look fun. Ranbeer Singh is new to me…actually IMDb says it’s his first film. Looks like he did a good job. Julie M: After further research I noticed that Ranveer Singh got his B.A. from Indiana University just a few years ago. IU is only 60 miles from me. Given how totally adorable he is, you would have thought I would have felt the heat all the way up here in Indy…ok, I’ll stop now. But he really is cute and I predict a career path for him doing roles that SRK did at that age. Jenny K: In that second number, he’s even wearing a very SRK choice in wardrobe! The designers would seem to agree with you…as I do. But in truth, the films that Shah Rukh did at that age submerged him in plots either psychopathic, seriously slapstick or revenge oriented. Let’s not wish that on these boys. Julie M: I think this movie is perfect for young people who have not yet become jaded on rom-com conventions. I thought it was pleasantly diverting and at times highly enjoyable, but I called pretty much every plot development within the first 10 minutes and spent the rest of the movie watching my predictions come to life. Man, I hate when that happens. Jenny K: Well, there is such a thing as RomCom Comfort Food, that some of us never get jaded by…so as long as there are attractive lead characters amidst beautiful scenery and a happy ending that will do until the next wonder-hit comes along. Somehow you don’t mind the predictability, it is actually reassuring. There is lots of cute new talent around these days. I went to see Mere Brother Ki Dulhan last night to see the now tried and true Imraan Khan. That young man just has a face that I can’t stop looking at. May be the Aamir resemblance, I just don’t know…maybe the moustache, here. Click for a close up. But the surprise was the young man starring as his brother, Ali Zafar, who does quite well for himself in his second film. I read that he’s quite a popular singer, especially in his home country of Pakistan. From his showing in this movie, I can say that Ali handled the comedy as deftly as the dancing, held his own with Imraan and Katrina, has a seductively rich speaking voice, and a recurring resemblance to a young John Stamos, that didn’t hurt him in my book. Check out the comparison shots and see what I mean….do you think John Stamos is actually Hindustani, not Greek? and he’s a calm, steady, nice guy that she doesn’t truly value at the time. Flash forward to where Kush (Imraan) is standing-in for his brother, Luv (Ali) who lives in London and wants Kush to find him a nice, non-NRI Indian bride. After much fruitless searching, Kush finally decides on Dimple (Katrina) as Luv’s perfect bride. But the way these stories go, lo-and-behold, in three short song medleys they realize they are in love with each other, and Bhaisaab is a distant, but ever nearing, memory… Egad! How will this turn out? Well, of course, we know…but I think its fun how they get there. My friend Pat thought the leading ladies were both “annoying,” but I didn’t agree. Katrina has scored another endearing portrayal, and yet it’s still distinct from her role in Zindagi Na Milegi Dobara. Here’s an excerpt from one of the love songs. The movie is shot in and around the Taj Mahal, which is, of course, gorgeous and yet somehow never too much of a good thing. My favorite song is one that took place when they all get a bit drunk on bhang (a local mixture of milk, almonds, sugar and spices with marijuana, delicious and potent!) at a roadside inn and the sing a song in tribute to Madhubala, who starred in the classic romance Mughal-e-Azam, and that poster is conveniently on the billboard next to their table?!? Unlikely, yes; lots of raucous fun, definitely. Pointless Nitpicking: I don’t get why no one thinks of the problem inherent in comparing an upbeat modern love story to Shah Jahan’s memorial to his dead wife, and also to M-e-A which details a doomed, albeit richly bejeweled, love story in another royal setting, neither of which have happy endings. Julie M: I bet they are anticipating a huge, young, NRI audience for this film, who are not as sensitive to such nuances. I think the Taj Mahal is marketed to foreigners primarily on the love aspect and not so much on the death/tomb aspect. Julie M: What does all that have to do with Lux soap, in the video? And do they really have 4 1/2 minute commercials in Pakistan? He is adorable, though. Someone to watch. Then afterwards the men got in the act…Mr. Metrosexual SRK being the first. Very tongue in cheek. Now it looks like they are going with even longer videos with the youngsters like Ali Zafar which you have, above. The three girls on the billboard become the three girls in the western, the pirate story and the “man on the street” bit, respectively. Julie M: That’s making sense now. Kind of like how makeup companies in this country use stars as models: Drew Barrymore and Taylor Swift for Cover Girl. Jenny K: And Beyonce and Aishwarya for L’Oreal…that girl is certainly the crossover queen, isn’t she. Workin’ all the angles!